The Davis house is situated on a triangular parcel of land just outside of Haddonfield, NJ. The existing brick ranch house was not in good enough shape to salvage and add to in lieu of complete demolition and construction of the new house. The house is situated to face the point of two streets, with a driveway that ties the two streets together. The house was designed for two “empty nesters” whose last child went off to college and it was our challenge to design a three bedroom, 2,400 sf house with a modest budget. The first thing to go was the duplication of rooms, just a great room with dining and kitchen, no additional living room or separate dining room was needed. 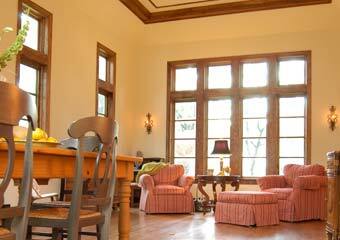 So as you enter the house from the foyer, the great room with high ceiling, and stained woodwork and transom windows is an impressive space. 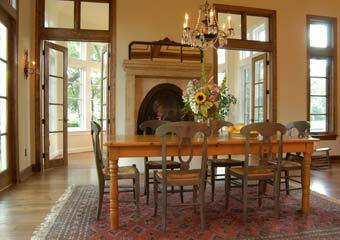 We included the dining area at the back and a separate music room. The kitchen broke from the hardwood floors to a slate tile with a bank of windows facing the rear yard. Also on this level is the master bedroom, not overly large but with a lively alcove for the bed, walk in closets and a wonderful bath with large shower. The garage is situated at the basement level due to the slope of the property, with easy access to the central switch back style stair. A partially finished basement houses an additional sitting room with TV area. 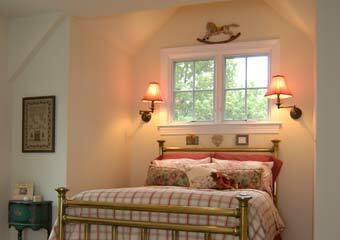 Upstairs, we included two additional bedrooms, hall bath and an art room. 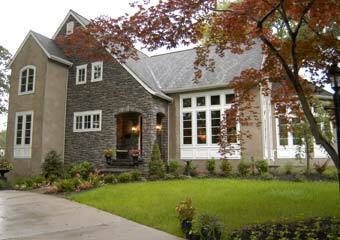 Outside, the house is clad with cultured stone and stucco materials. The long sweeping roofline provides a place for a covered entry at the front door. The house was constructed by Tri-County Development of Medford.